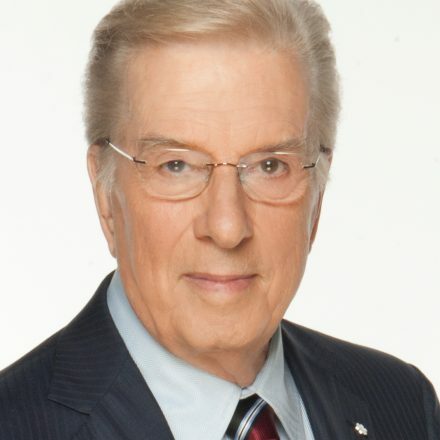 Esteemed broadcaster Lloyd Robertson is encouraged that the Canadian media is reporting stories about mental health with a greater understanding and awareness, having grown up with a mother who suffered from the illness and seeing the disease affect two of his four children. Robertson delivered a personal and moving keynote speech about that on October 27 at Markham Stouffville Hospital Foundation’s annual Mental Health Education Day. The theme this year was bipolar disorder. Robertson, who lives in Markham and last year was appointed Chair of the MSH Foundation’s new Fellowship Group for financial donors, spoke to a group of doctors and patients. The speech was simulcast into another area of the hospital where donors could watch and later meet Robertson and receive personalized signed copies of his 2012 memoir The Kind of Life It’s Been. Robertson told the audience he came to the hospital figuratively wearing two hats: one as the child of a mentally-ill parent who has lived through the stigma and knows the negative and debilitating effects it can have living life in the shadows and talking about personal matters in deep whispers, if at all; and the other as a member of the media, dealing with many stories about where mental illness was at the epicentre of the news narrative. He said he was among many members of the Canadian media and journalism students interviewed by medical journalists who were putting a brochure together to help explain mental health reporting to the public. “I had my say on the point that the field of mental illness is one of the last frontiers in the fight against outright discrimination,” he said. “Taunts against the mentally ill seem to have been immune from censure down through the years. In his book, he wrote about his mother, Lilly Mary Frances, and her battles with a string of mental and emotional disorders. Readers were so moved, he expanded on it in a second edition because when he did a tour to promote the first edition many of the first questions from media colleagues were about what it was like to live with a mentally-ill mother? He titled the afterword Lilly Mary’s Moment. “I knew that this idea of mental illness was really percolating in people’s minds everywhere,” he said. He wrote in the book that while his father demonstrated total compassion in dealing with his wife’s illness, Robertson said he was “embarrassed and ashamed” that someone so close to them could have such a problem. He said those were the times when the stigma surrounding mental and emotional problems were so much more pronounced. He added that his father reminded him that his mother couldn’t have done anything to prevent her condition and he was to regard her the same way as any other person with a serious incapacity. At the recommendation of psychiatrists, she underwent a prefrontal lobotomy, which drained her of any dimension of emotional response. He wrote in the book that her condition has haunted him all of his life. “She would have given anything to be a better mother to her two sons,” Robertson said of him and his brother Gordon. “We never spoke about it to anyone, and if someone asked we would simply try to ignore it. We knew all about the stigma. What others do not accept about the reality of mental illness, families (who experience it) have little choice but to withdraw from relationships, both to protect themselves and their loved one. They are unwilling to take any more risks about being hurt or rejected. “Family members may be reluctant to invite anyone into their home because the ill person can be unpredictable and is unable to handle the disruption and heightened stimulation of a number of people in the house. He praised mental health advocates such as Margaret Trudeau, mother of Prime Minister Justin Trudeau, who has written books about her own experiences with the sickness. Robertson also pointed to decorated Canadian Olympian Clara Hughes, who wrote about her struggles in an autobiography and has become a key spokesperson for Bell Media’s annual Let’s Talk Day about mental illness. Broadcaster Michael Landsberg, another advocate for openness about the subject, received praise from Robertson. Robertson also noted that legendary broadcaster Mike Wallace, whom he knew, discussed late in his career in a candid interview with colleague Morley Safer that he’d once attempted suicide. “He caught himself soon enough. Thank goodness for that,” Robertson said of Wallace, one of the most respected broadcasters of his era. Robertson pointed to his own experience, which he wrote about in the book, about how he had become mentally stressed during a CBC labour strike in 1972 between the union representing the technical workers and CBC management. Robertson, as a high profile member of the announcer’s union which was not on strike and could cross the picket lines, was pressured to help gather support for the striking workers. He led the organization of a one-day walkout in support of the technical staff. But when hardliners wanted him to organize more days of disruption, it started affecting him and he had trouble sleeping. “I was walking the floor hallucinating, (his wife) Nancy was very worried about what was going on and she called the doctor, who immediately dispatched me off to Homewood,” he said, referring to the mental health centre in Guelph. “I went in, I was dead tired. I hadn’t slept in days and I looked at (the psychiatrist) and he looked at me and said, ‘sit down.’ Oddly enough, he didn’t offer me a couch, so I said ‘can I just get down on the floor.’” The lead psychiatrist diagnosed the issue as sleep disorder. Other staff in the facility thought Robertson may have had some more serious form of mental illness because of his mother’s problems. He was given some medication and was able to sleep and was subsequently released from the health centre in a couple days. “I took the medication faithfully and I felt closed in and a bit strange for a few weeks, but I reverted to my old ways of not telling anybody about anything,” he said. “I went back to work and gradually got back into my regular pattern, Nancy and I went away on holiday and about three months later I was clicking along again as I had been before. When I encountered the Guelph psychiatrist many years later, I thanked him for his analysis that had spared me over-medication and helped me plan my way back to normalcy.